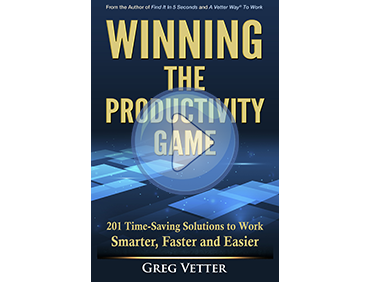 5 S AND A VETTER WAY® | Vetter Productivity, Inc. Determine what items are needed in a work area from those that aren’t. Create extra work space, make work flow more visible, and improve productivity, safety, and quality. All paper, items, etc. always go into the Inbox first rather than on any surface. Create a paper information flow. A five-step process is used to sort the information (OATS) in the desk Inbox. Create an electronic information flow. From the e-mail Inbox, all information is sorted using the FADS system. Once a year, all files in your computer, e-mail, smartphone, and file drawers are gone through, decided on, and cleaned out. Separate your Action (tasks to do) items from your Support (information that you will reference and save) items. Keep necessary items in the correct place to allow for easy and immediate retrieval. Eliminate the need to search for tools and supplies, improve safety and productivity, and reduce wasted motion. Keep only five things on your desk. Break down everything in your office by subject (Categories) and store them together. Keep tasks to work on only in your e-mail program, smartphone, and paper Action Category hanging folders. Keep everything off of the floor and walls in your office. Keep an open pathway to your desk. Turn your desk away from the door and distractions. Keep work areas, work surfaces, and equipment clean and free from dirt, debris, etc. which will result in a clean, more satisfying place to work, improve quality, and promote fewer accidents. Clean the work area daily. All loose paper goes into the desk Inbox. Nothing goes on the desk surface other than five specified items. Wipe out all drawers, shelves, and surfaces. Establish standard activities, procedures, schedules, and people responsible for helping keep the work place clean and organized. Quiet Time (20% of your workday, uninterrupted, and spent on very important tasks). Information flow (information flows the same way at the same three times daily). Standardize your information storage system (filing system). Use the same work system model everywhere including your paper and electronic files. Drive the organization to be disciplined in maintaining these new standards and procedures and to continuously improve the state of the workplace. Process information three times a day. Produce work three times per day. Once a week go through all of your Action files in your e-mail program and file drawer and prioritize them. Batch similar activities and work on them during the same times. Spend 20% of your day in a Quiet Time (QT) working on your most important tasks. 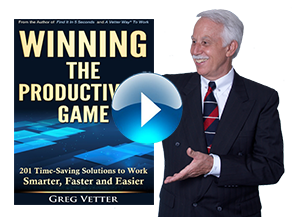 Create work processes for all of your repeated tasks.